Our exclusive 40 page guide to the apartment and Medellin. This bright and airy, newly furnished two bedroom apartment is situated on the 13th floor offering a beautiful green view from one of its two balconies. The municipal city gardens are located behind the building and offer a calming view and bird watching opportunities. Featuring a queen sized bed in the master bedroom and a double in the second bedroom and all new furniture throughout including TV in both the master bedroom and the living room. This apartment has been lovingly decorated to give you the comfort you deserve while on your holidays. Located perfectly between the popular Zona Rosa and Premium plaza, this apartment offers convenience as well as peace and quiet. 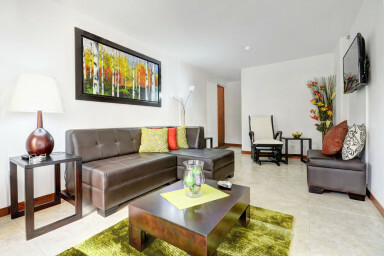 Situated next to the Dan Carlton Belfort Hotel and within easy walking distance of Parque Poblado, several shopping malls and the main thoroughfares of the city, this apartment is both a relaxing hideaway, surrounded by gardens and nature, as well as a great stop off point for all your Medellin activities.